I have been patiently waiting for Rob to post our Colombia photos. I wanted to be able to share some of my photos and tips from the trip. The full albums from Bogota and Salento are here and the Lost City and Cartagena are here. I have included a few of my favourite photos, though. 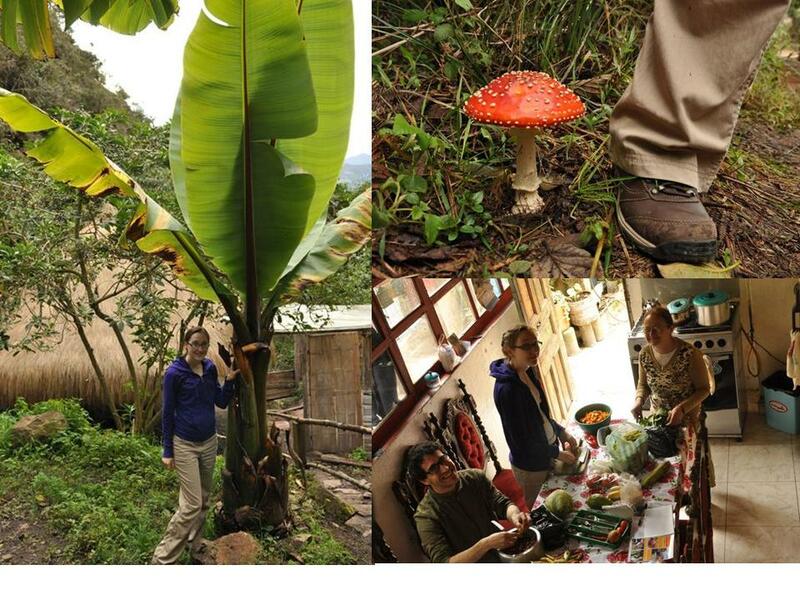 We were in both hot and cold places, with big banana leaves and small mushrooms… and enjoyed a wonderful cooking class in Bogota. 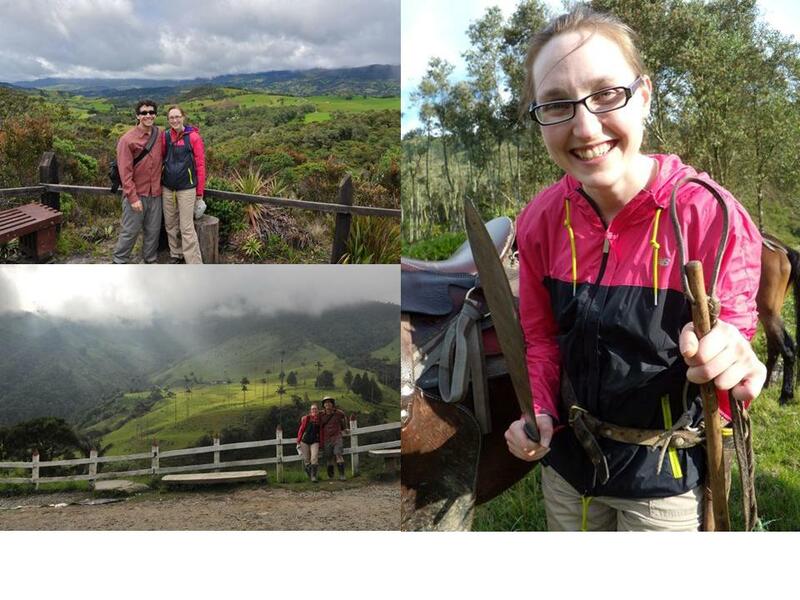 We saw lots of beautiful scenery, especially in Salento, where we rode horses in the valley and I was able to play with our guide’s machete! With tons of hiking! 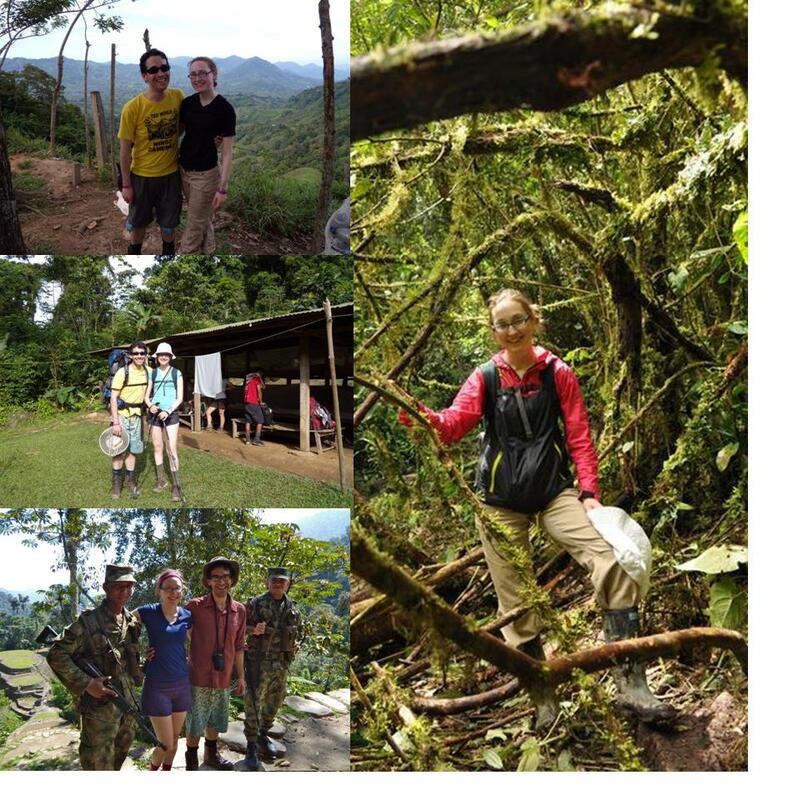 In and around Bogota, Salento and the biggest of hikes- to the Lost City which is patrolled by the Colombian army. This is my first Colombian meal I have prepared in my own kitchen- red beans with plantains. Although I will admit that I never came across this dish while in Colombia. 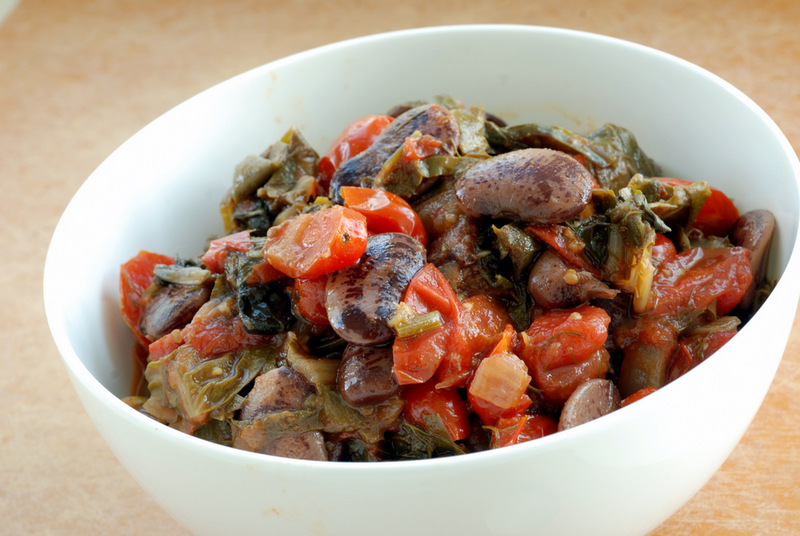 Red beans, yes. Plantains, yes. Never together which is why I was intrigued to try out this recipe from Viva Vegan. Who would have thought there would be even more beans that I do not yet have. I had to restrain myself from bringing home too many new beans from Colombia. I figured they may be more easily found once we move to the southern US, so I don’t have many Colombian bean souvenirs. The standard Colombian bean (that is not the coffee bean), is the bola roja. 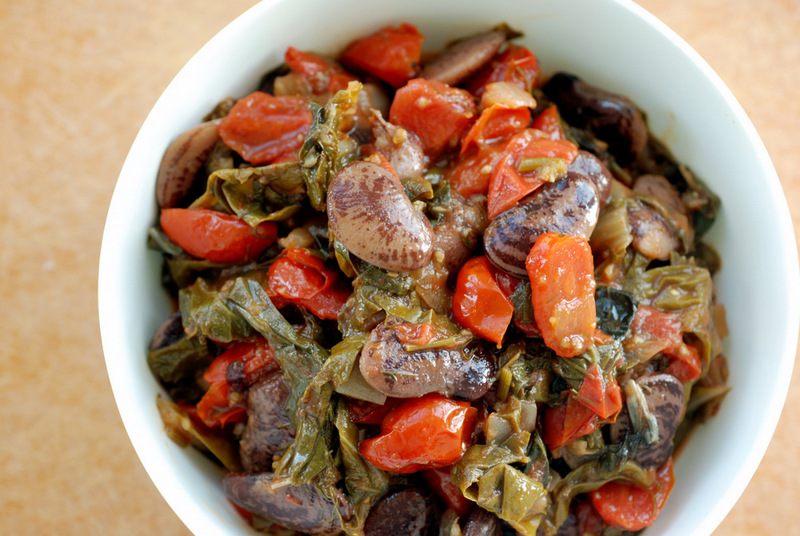 Another standard is the Cranberry bean (also known as Borlotti or Cargamanto), which I have cooked before. They are a bigger creamy bean although a bit dry. However, within my Rancho Gordo stash, I had Sangre de Toro beans which I used instead. 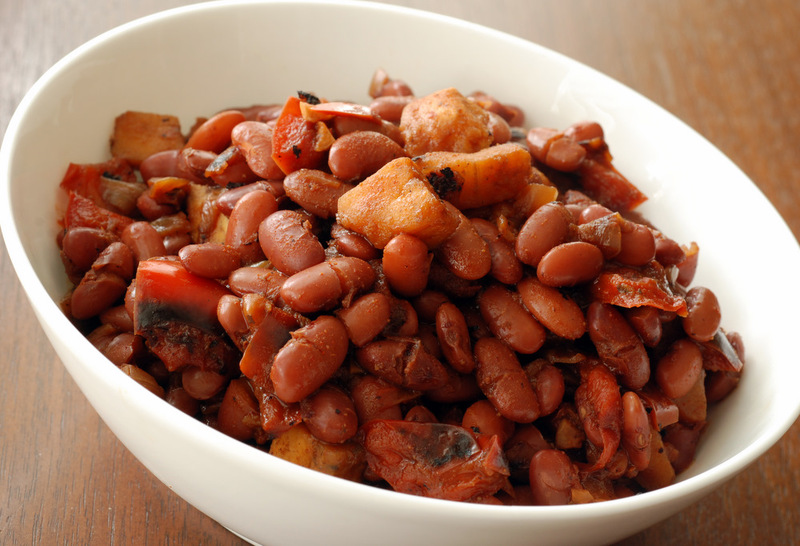 Dense and almost chewy, they are Mexican beans that can be substituted for any recipe calling for red beans. This is my submission to this month’s My Legume Love Affair, hosted by Simona, and to this week’s Weekend Wellness. I was away last week and Rob was in charge of watering the garden. I knew one of our squash plants was not doing so well after the scorching heat wave. I was already mentally prepared for the loss of a squash plant. Four plants in a small planter was probably not the best idea anyways. Even if 1 of the plants die, at least I will have 3 squashes. However, it turns out that we have probably lost 3 out of our 4 plants. AND…. to make matters worse, of the 3 squashes, one was ripped off the plant and eaten. Another had a large nibble removed. Only one survives. Rob swears it wasn’t him. We blame the raccoons! 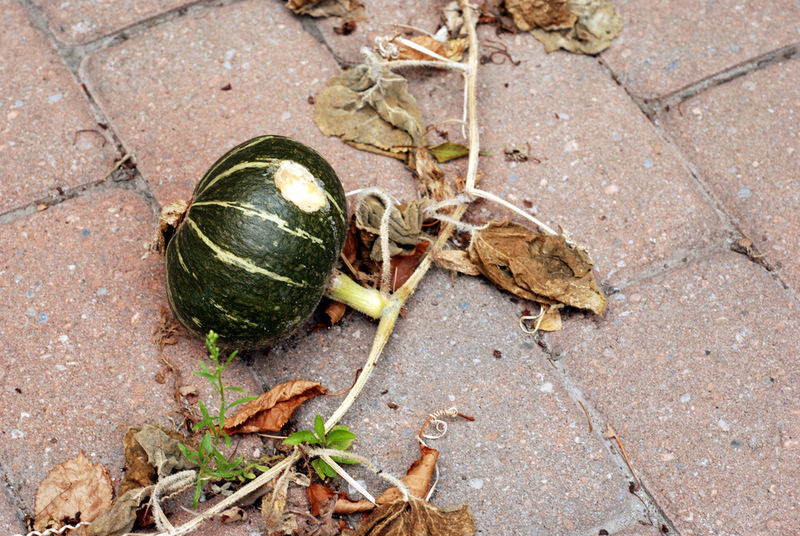 But please, raccoons.. do you really need to munch on an unripe kabocha squash? Gah! I kept telling myself well if nothing else, we will have a huge kabocha squash by the end of the summer. Sadly, I don’t even see any more blossoms to do more self-pollination. It really makes you appreciate farmers and their struggles. Thankfully my kale, collards and herbs are growing strong. 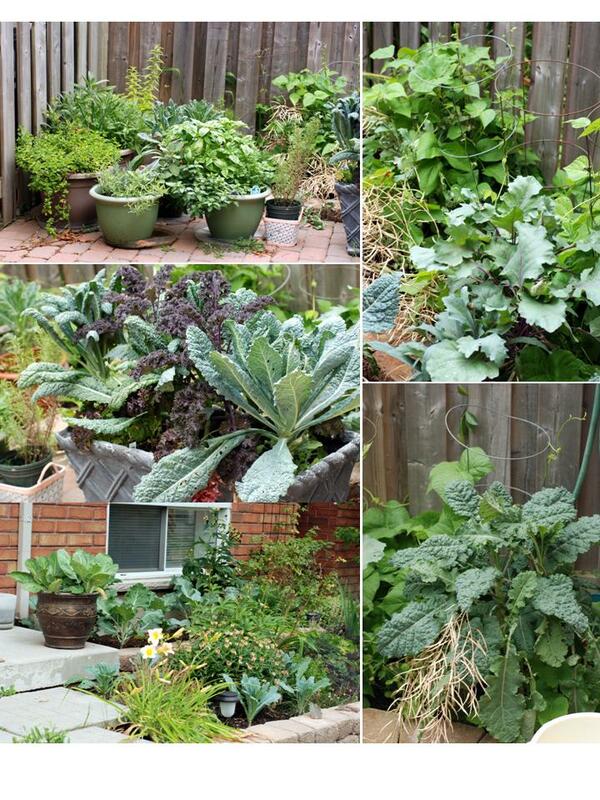 The backyard planter has had great plants, although our front yard still has smaller kales. 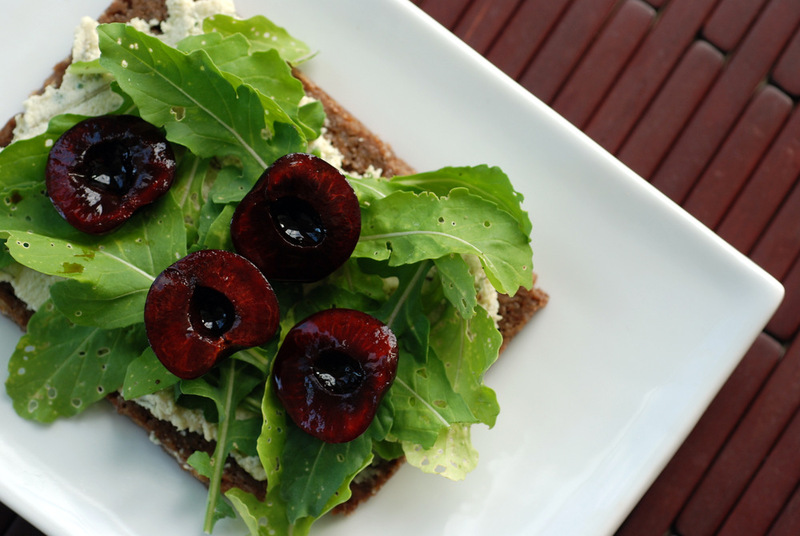 I have a handful of arugula growing, too, which I used for this sandwich. Holey in all its organically-grown-in-my-backyard glory. Looking at the photos, you’d think it was a green jungle out there! 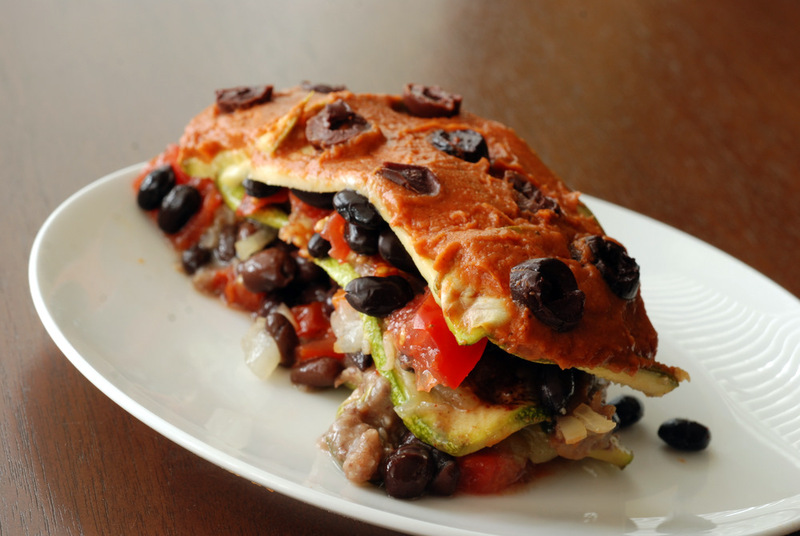 Inspired by Gena’s raw pizza, I cobbled this sandwich together after my trip. First, I marinaded cherries in maple-sweetened balsamic vinegar. Then I made a rosemary-infused cashew spread. A handful of my backyard arugula tops a maple pumpernickle (sourdough rye) bread that I picked up in Calgary. 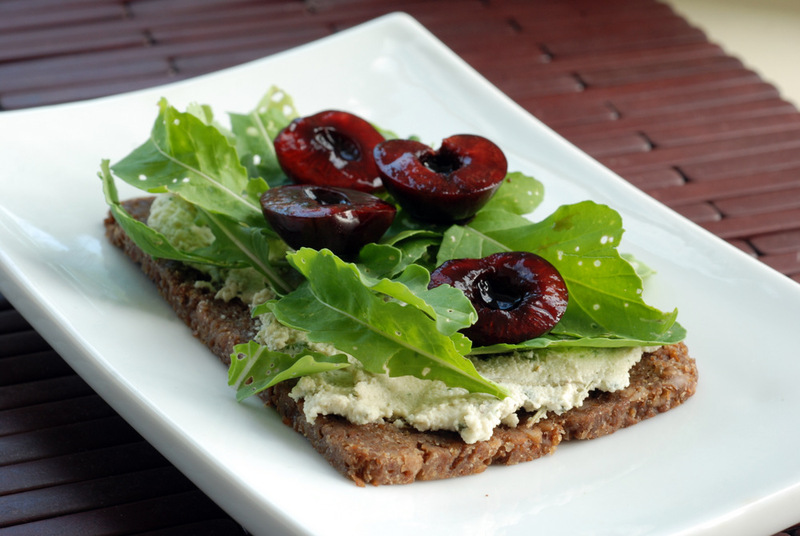 The contrast in flavours worked really well together, although I had a hankering for a more sour cashew spread. I think I need to find some probiotic capsules to help me with that… Next time! This is my submission to Deb for this week’s Souper Sundays and to this week’s Weekend Wellness. Let me share with you the best way to travel. I’ve shared travelling tips and recipes before, but this is different. I feel like I have discovered a new way to find great lodging while travelling. I am not talking about priceline or other websites which have lower prices on hotels. Been there, done that. I have never liked hotels, anyways. Without a kitchen and other homely accessories, I still feel out of my element. Last week, I was in Calgary for a conference. Fortuitously, only half the cost of the hotel room would be covered by my employer, and I could not find another person to share a room. So I looked for alternatives. I discovered Air BnB (and no, I get nothing to shamelessly promote this). A site where people rent out their homes just like a hotel room. Granted, each listing is bound to be different, but I really lucked out in Calgary. For half the price of the conference hotel room, I rented out an entire 2 bedroom bungalow that was not too far from downtown. It had a well-stocked kitchen, a living room complete with board games and oodles of books to read, if I actually had the time. Of course, I was drawn to the kitchen, so I could easily whip up my routine breakfast oatmeal and other healthy meals. With an Asian grocer a few blocks away, I had access to cheap groceries as well. While I think of travel as a vacation from blogging as well, I was wrong. 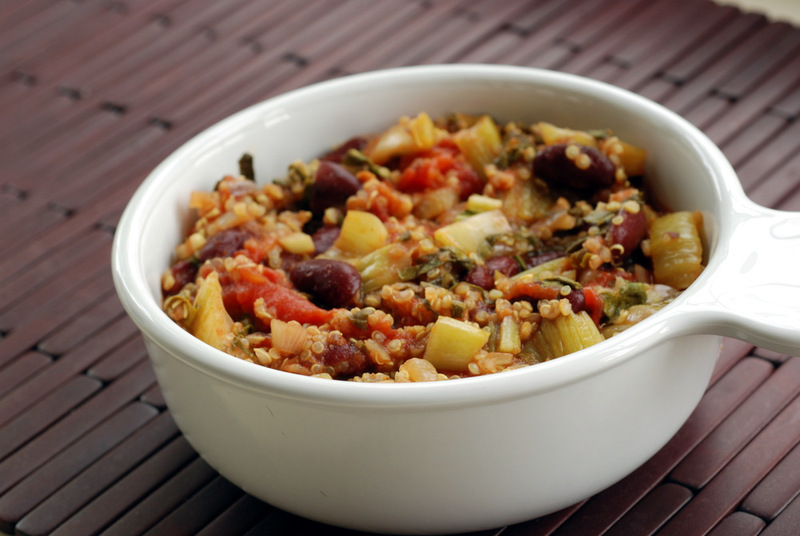 I desperately wanted to share some of the quick and easy meals that I pulled together. I brought quinoa with me so that I could turn any vegetable stir fry into a quick main meal but I ended up going more elaborate with this curried tomato and kidney bean bowl. The results were worth it and have already been incorporated into repeater meals in my own kitchen. The ingredients seem so simple, so the bulk of flavour comes from the high quality curry powder. When I spotted a local Artisan curry powder (Bridget’s) at Community Natural Foods, it was then that I decided to make this. Shallots (or onions), ginger and garlic are sautéed and added to the curry powder. 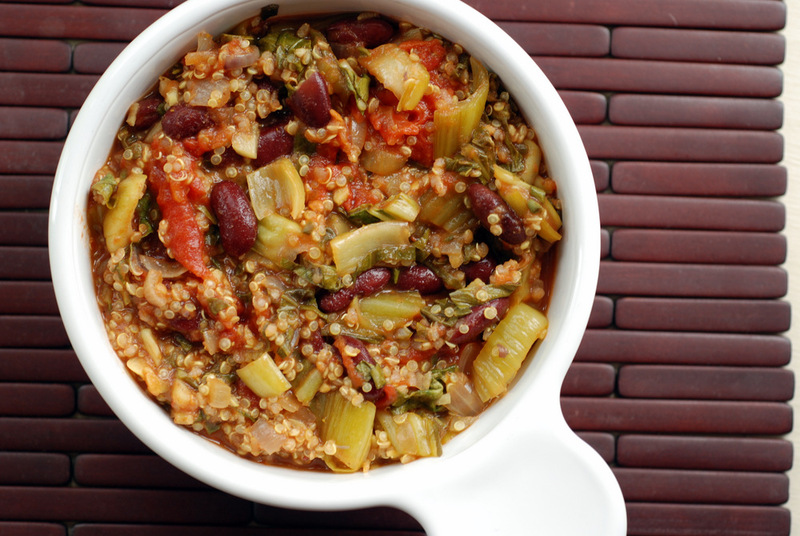 A can of tomatoes turns this into a great sauce that simmers with some kidney beans and quinoa. I added chopped baby bok choy for some greenery and crunch. 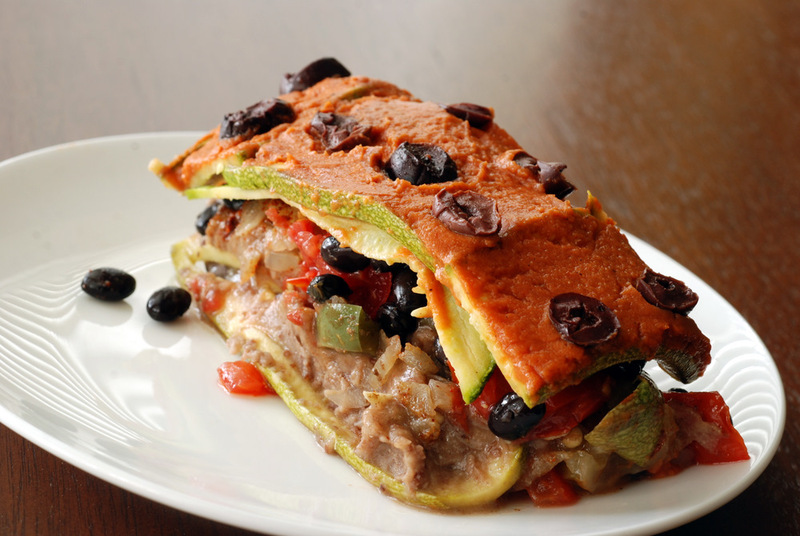 Susan originally made this as a lettuce wrap with chickpeas. 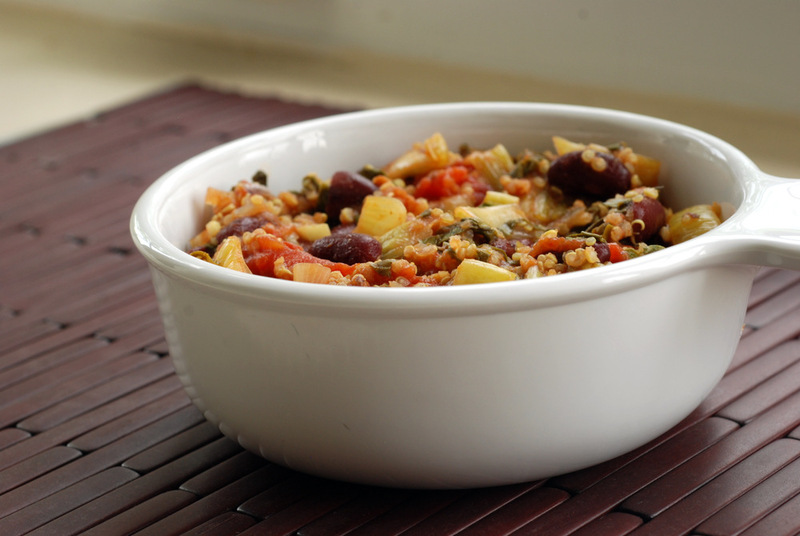 I have since made this since my return with chickpeas and more quinoa; it is a very forgiving recipe. Like most curries, this was great as leftovers. And yes, I was thrilled that my kitchen in Calgary also had plastic containers for me to tote my meals to the conference. Who would have thought I’d eat so well away from home? If you can’t tell, I am all about the greens. 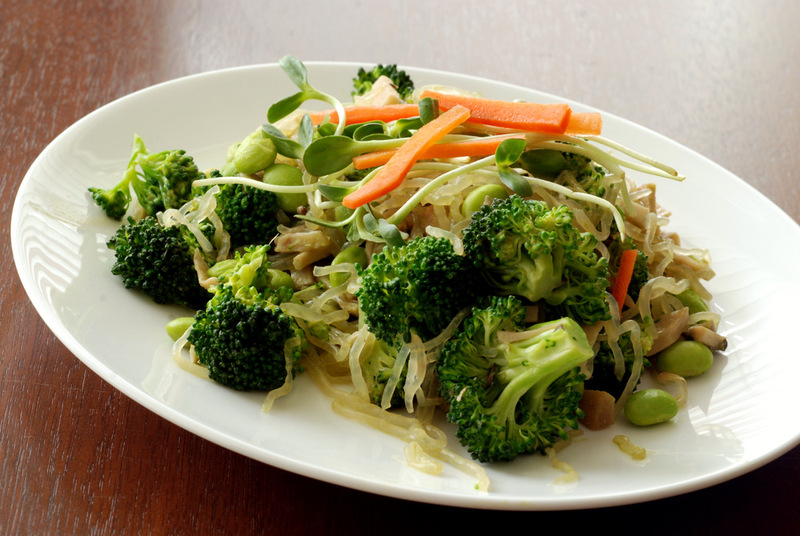 Any kind of vegetable, bring it on [except celery]. I still buy leafy greens even if my garden is growing kale and collards. Especially when they are 2 HUGE bunches for $1. When I mean huge, I decided to do the weight test. Each bunch clocked in at 2 lbs. That’s the equivalent of 4 bunches for $1. Booyah! Surprise sales. That’s when I get in trouble. What the heck to do with all the greens? This is being submitted to this week’s Weekend Herb Blogging, hosted by Marta, and to this week’s Weekend Wellness. How often do you second guess a recipe? Something just doesn’t seem right… an odd ingredient, a different preparation technique…. what do you do? Try something new or resort to your old habits? Even a small change in herbs or ingredients can change a meal, and a new technique can have great results. But sometimes, it doesn’t make sense. 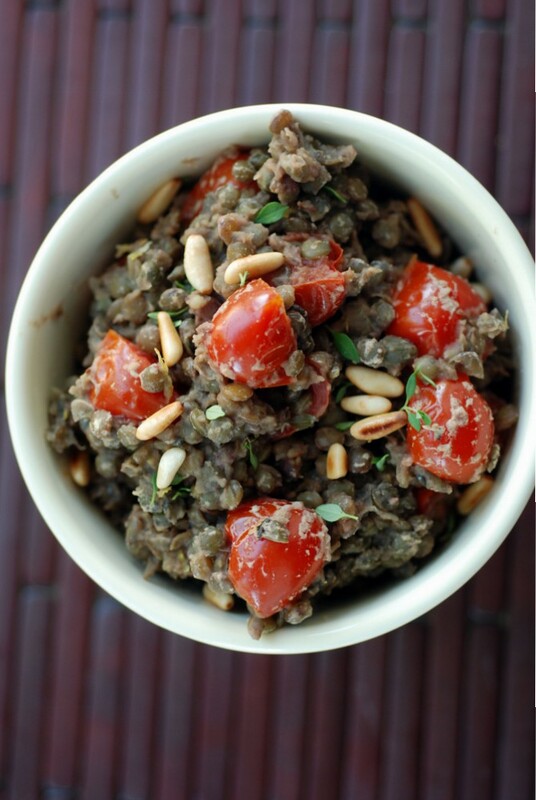 Dreena Burton’s recipe for this Lemon Mediterranean Lentil Salad had me scratching my head. Cook my lentils in lemon juice? With oil? Had I not learned my lesson with the Green Mango Curry? Acid makes for firm beans. 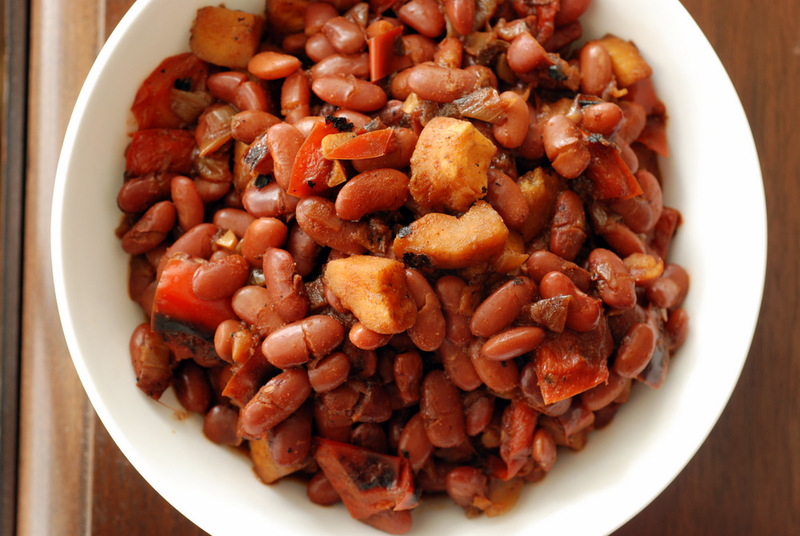 Even dry-toasting makes beans keep their shape. I want my beans to cook! 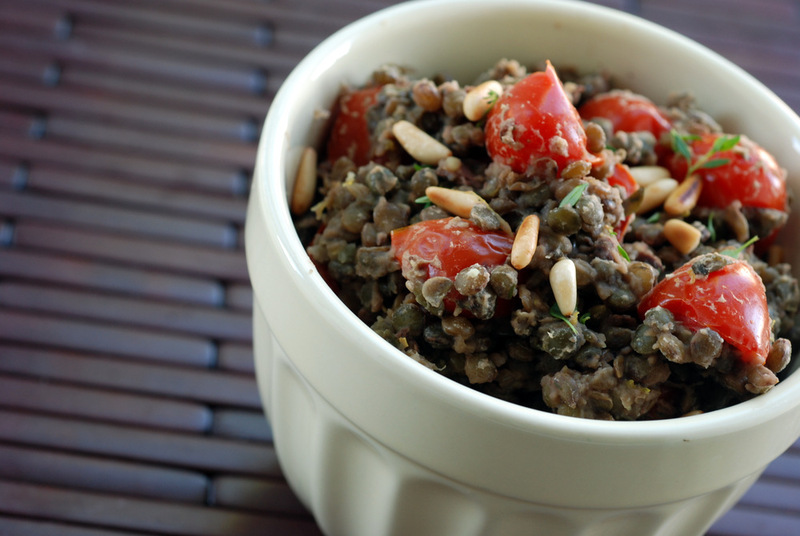 Heck, I already know that the secret to great lentil salads is to use French du Puy lentils. 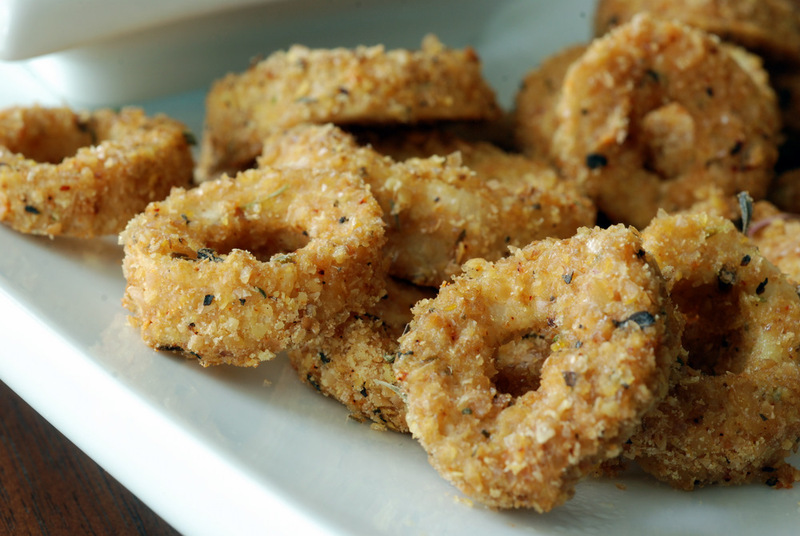 Quick cooking, they also keep their shape and hold up well to salads. So, I forged ahead… ignoring the plea to simmer the lentils in lemon juice. Forgoing the suggestion to toast them beforehand. My mistake: The original recipe didn’t say to drain the lentils. So I didn’t. I should have. 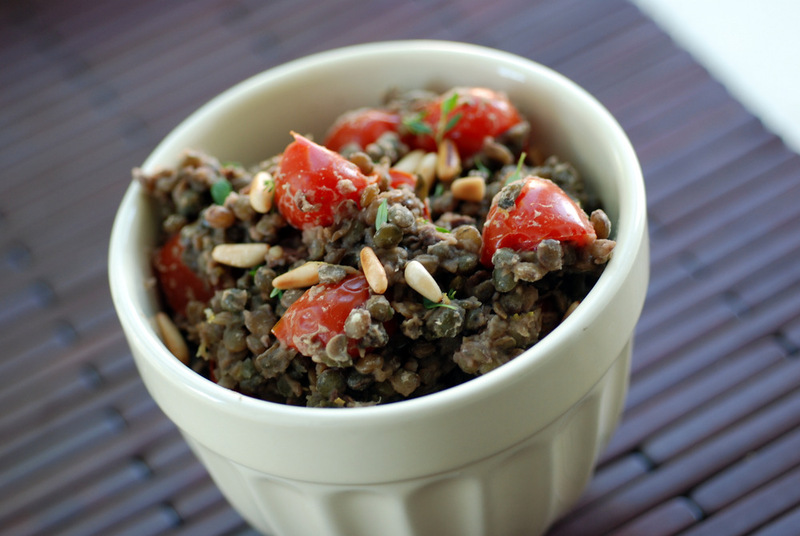 The glory of this salad comes from the simmering finale of the herbs and tomatoes with the cooked lentils. The olives, capers and lemon zest add a delicious mix of flavours that permeate the lentils in a great way. Except, because I had omitted the lemon juice and toasting, they kept cooking. They became mushy. Still uber delicious, but not as firm as I prefer for my lentil salads. Not as photogenic as I would like, but this recipe was too delicious not to share pronto. I know I will be remaking this, during the perpetual season of summer potluck gatherings, but I did not want you to be deprived of such a great dish… although may I suggest actually following the recipe? 😉 Let me know how it goes! This is my submission to this week’s Summer Salad Sundays, to this week’s Healthy Vegan Fridays, to this week’s Weekend Wellness, and to Deb for this week’s Souper Sundays. Who says vegans can’t have fun at a barbecue? It isn’t all about the balsamic grilled portobellos.. although they are delicious. Please don’t turn off your barbecue too early. Let me tell you that it should involve dessert, too. At my latest barbecue gathering, I experimented with grilling fruit. 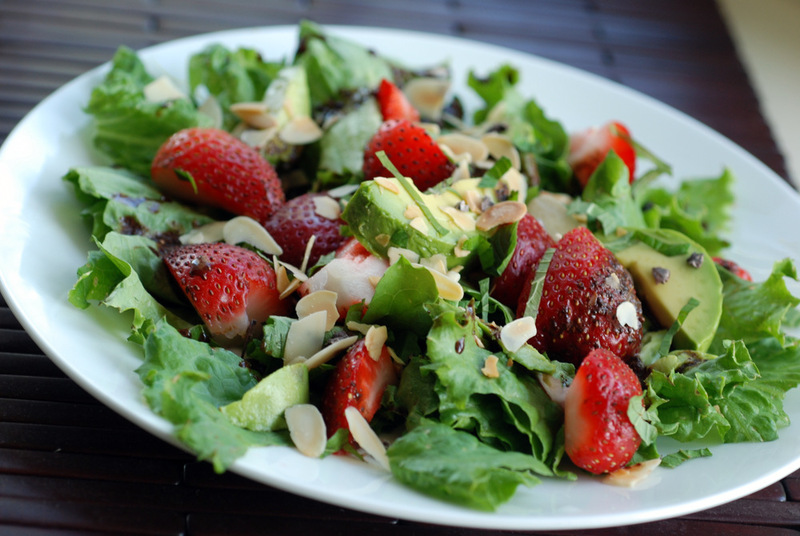 No stranger to roasting fruit (remember the roasted strawberry balsamic dressing? ), grilling them also brings out their natural sweetness. 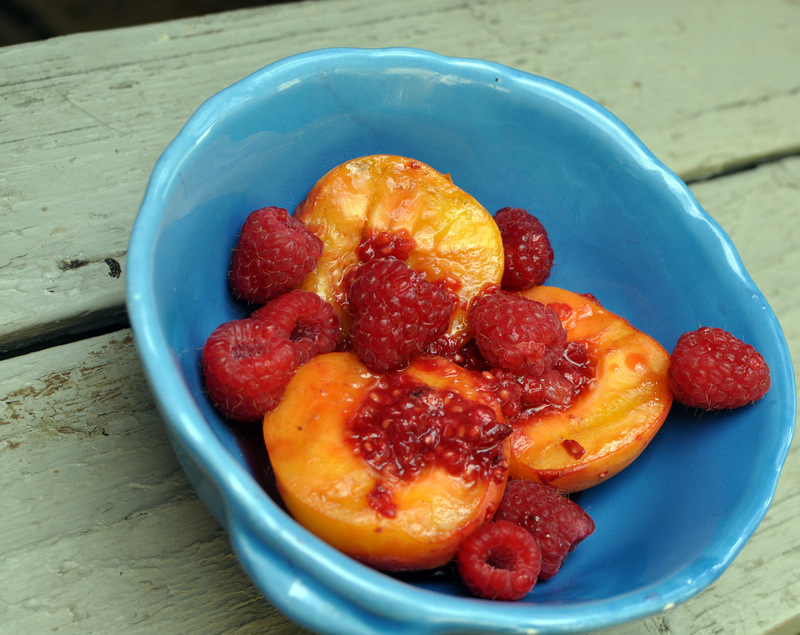 With the first Ontario peaches rolling off the trees, I was excited to try these grilled peaches with a sweet raspberry sauce. Super simple. Mash some raspberries and mix with some lemon juice and a touch of sweetener. Let the peaches marinade for a bit, then grill. Top with more fresh raspberries and drizzle with the remainder of the sauce. Easy, peasypeachy and so much more than the sum of its parts. Granted, local summer fruit is already pretty spectacular but this definitely brings it up a notch. 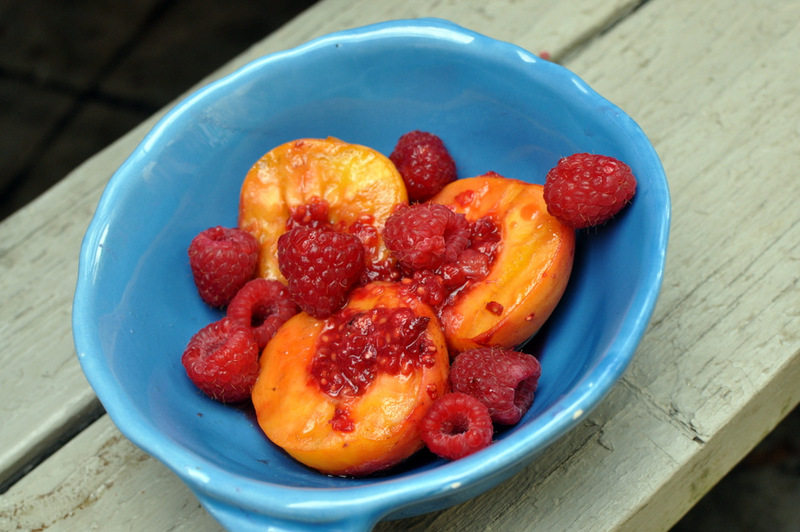 A typical peach melba recipe has one boil peaches in a sugar syrup to accentuate its sweetness. I say forget those 3.5 cups of white sugar and resort to grilling instead! Peaches already possess all the sweetness you need: you just have to gently coax it out of them. Next time, I definitely plan on eating this overtop some banana soft-serve ice cream! This is my submission to Ricki and Amie’s Backyard Barbecue Event, to this week’s Wellness Weekend, to this month’s One Ingredient challenge for peaches, to this week’s Potluck Party, and to Cookbooks Sundays. Thank you, guys, for your positive responses to yesterday’s less than photogenic (but tasty) dish. This falls under the same category… but I had to share it! I often get asked what I miss most now that I am vegan. Going vegan was easy for me because I don’t really like cheese and eggs. I used to drink tons of milk, though: 4L in a week. After I gave up breakfast cereal, I don’t even drink much nondairy milk. Going whole foods-only was easier because I don’t really like white rice and bread. As a child, though, I adored Parmesan cheese. I’d eat it straight from the freezer. Can I have some smelly cheese, please? My Mom would buy the I-have-no-clue-if-it-is-really-food Parmesan cheese from Kraft. It wasn’t until university that I discovered the marvel of freshly grated Parmesan. It put the Kraft container to shame. I recently made this vegan Parmesan sprinkle and thought it deserved its own post since it was so good. Not freshly grated melty Parmesan good, but more in the other Parmesan camp. 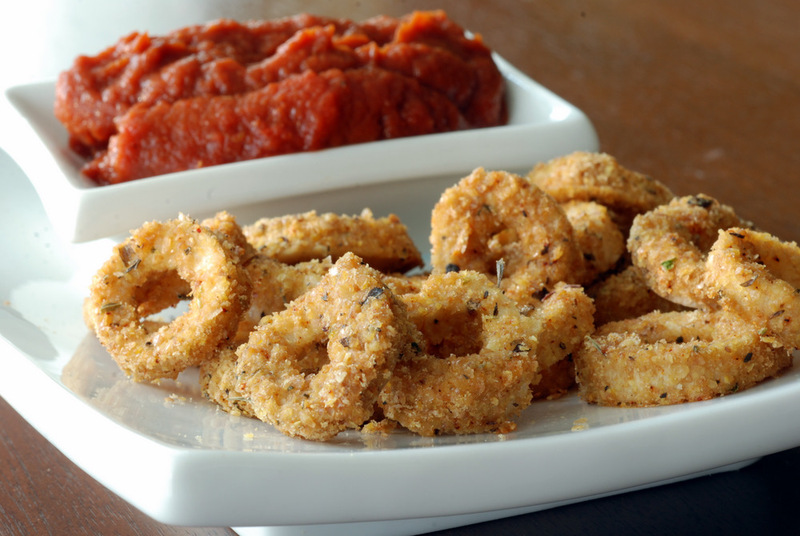 It got me thinking what I used to love about Parmesan: the crunchy bits, the salty tang, the hard cheesiness. Like all vegan cheeses, this isn’t exactly like cheese but it is the closest imitation to anything cheese-like I’ve made thus far. While it isn’t a dead-ringer for Parmesan, it comes pretty darn close! 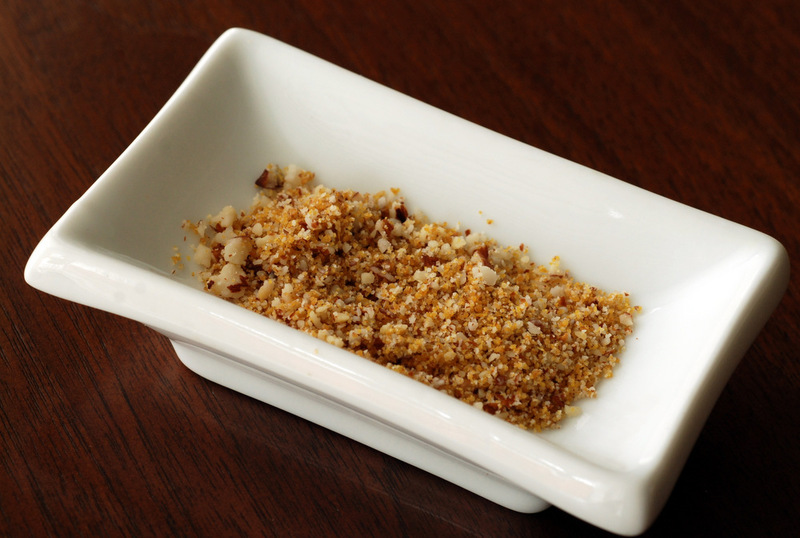 There are many versions of vegan Parmesan (basically ground nuts/seeds with nutritional yeast +/- flavours), and I chose Bryanna’s version which Zoa uses routinely. 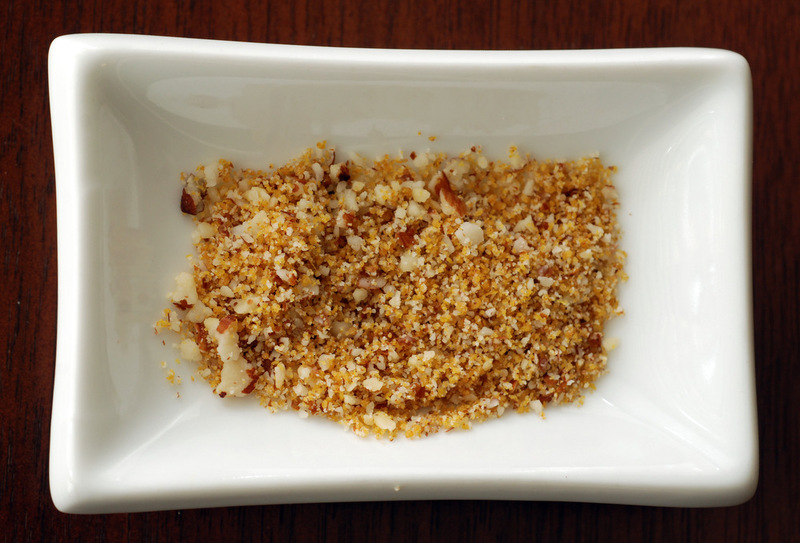 You start by grinding some almonds with nutritional yeast and salt. Miso is the magical ingredient (ok, when is it not?). 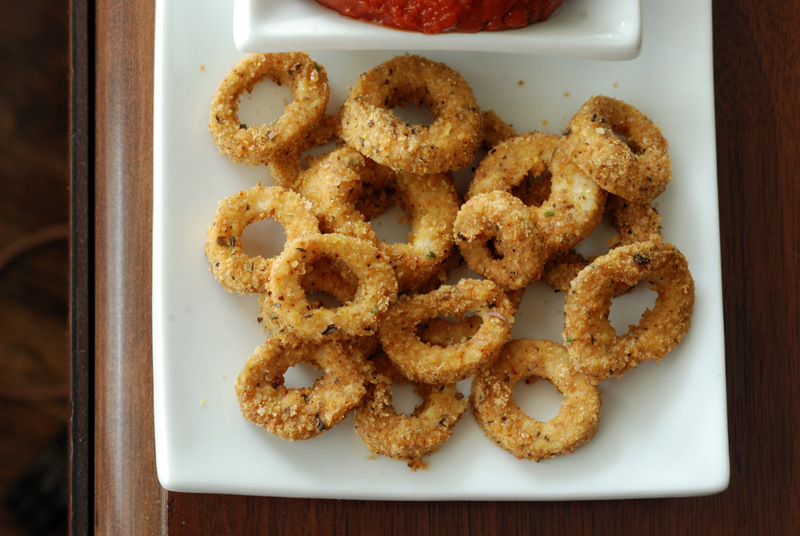 It brings it all together with some moisture, some saltiness and its wonderful umami. I decided to sprinkle it on a simple veggie salad for lunch, inspired by Gena (white beans, cherry tomatoes, cucumber, fresh basil, balsamic vinegar, baby greens and this almond parmesan), but feel free to add it wherever you typically use Parmesan. I am already imagining how I will use it for a risotto. 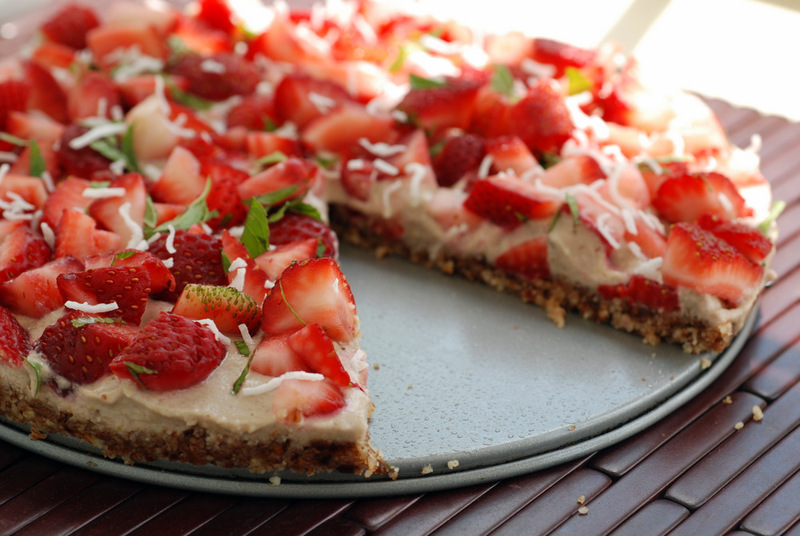 It would have been lovely with my High-Protein Creamy Roasted Cauliflower Alfredo Pasta, too. This is being submitted to this week’s Weekend Herb Blogging, hosted by Cleare, to this week’s Raw Food Thursdays, and to this week’s Wellness Weekend. Yes, I bought more strawberries! At one point, I had fresh strawberries, blueberries, blackberries and cherries in my fridge. Oh, and Rob’s bananas, too. I am addicted to the fresh fruit. It was a good thing that Rob didn’t buy the case of fresh figs, too. My Mom is probably scratching her head.. I just told her that I spend around $10-15/week on groceries. Granted, I have a pantry packed with my staples (beans, grains, nuts, spices) and a garden with herbs and greens (kale and collards) which makes things easier. Each week, I basically buy fruits and veggies. Cilantro, green onions and regular onions, too. Garlic and ginger every few weeks. Tofu or tempeh once a month. Veggies aren’t that expensive, guys! My recent grocery glories were zucchini for 39c/lb, bananas for 29c/lb and red pepper for 79c/lb. Oh, and two HUGE bunches of Swiss chard for $1. Suffice it to say, strawberries were on sale for $1.50/lb, so I got some more. 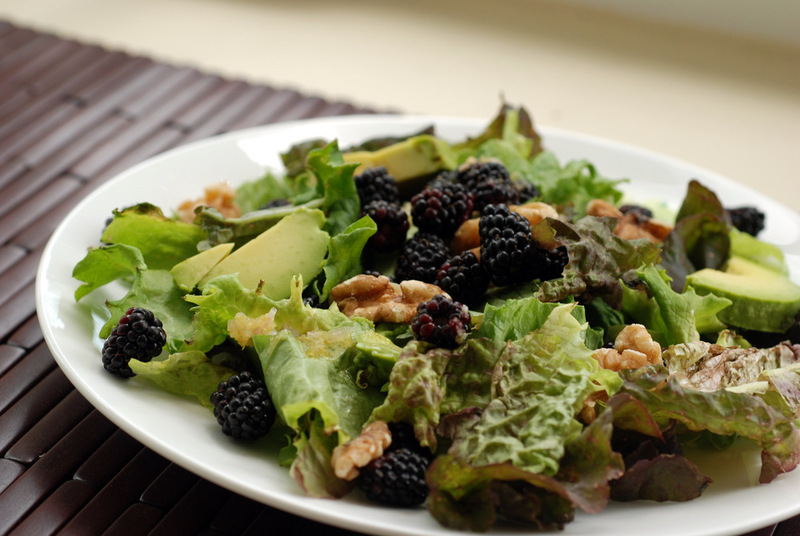 During my week of the salad, I tried so many different leafy salads. I am not that heavy with salad dressing, so they last a long time. I still have dressings left over. I need more greens! I also like variety, so I tried yet another dressing. This time, though, I made less. 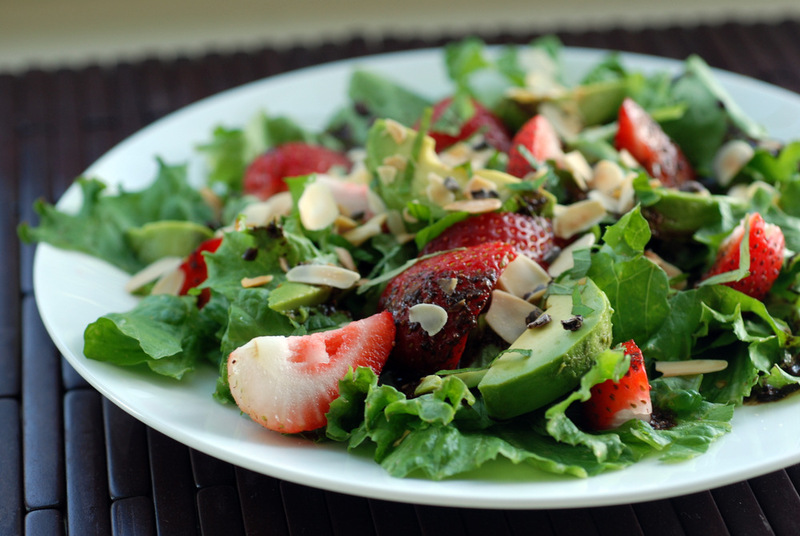 This is a simple dressing to put together, so I can easily whip it up again. And I will because it was glorious. Roasted hazelnut oil. Balsamic Vinegar. Chocolate. Need I explain more? 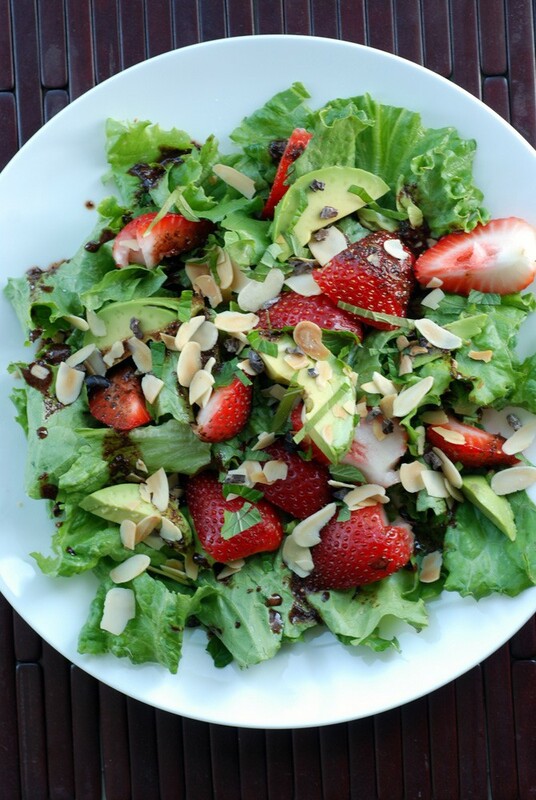 Oh wait, please, let me tell what I paired the decadent chocolate balsamic vinaigrette with: Strawberries. Avocado. Mint. Toasted Almonds. 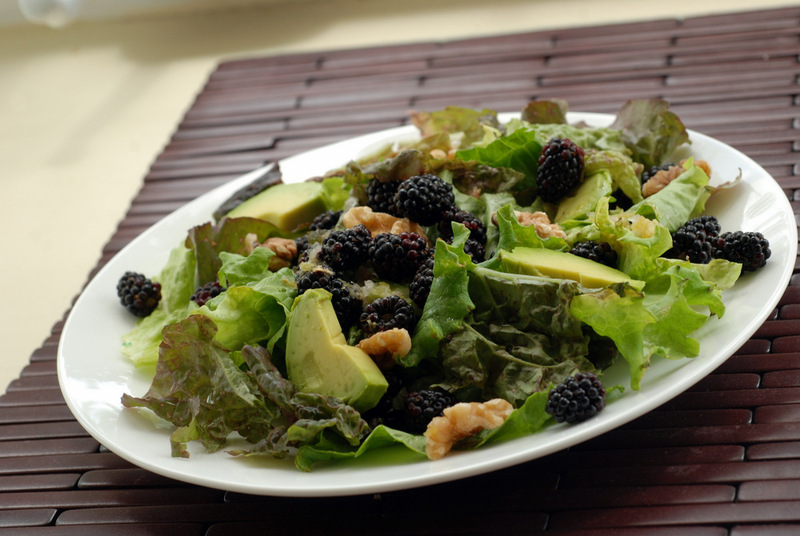 Raw Cacao Nibs…… oh, and lettuce, too. I know some people don’t like fruits in savoury dishes (not me!) but here I am left scratching my head wondering whether this should be dessert or an appetizer. Does plating something on lettuce automatically relinquish this from being a possible dessert? Anyways, I ate this for dinner. And it was delicious. 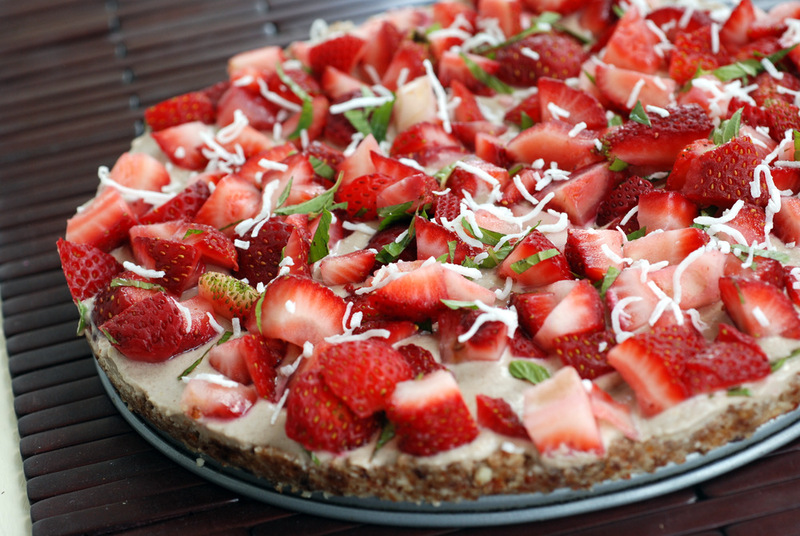 With chocolate crepes, coconut cream and cherries and raw strawberry pudding pie for breakfast, it seems like I am eating dessert all day long! 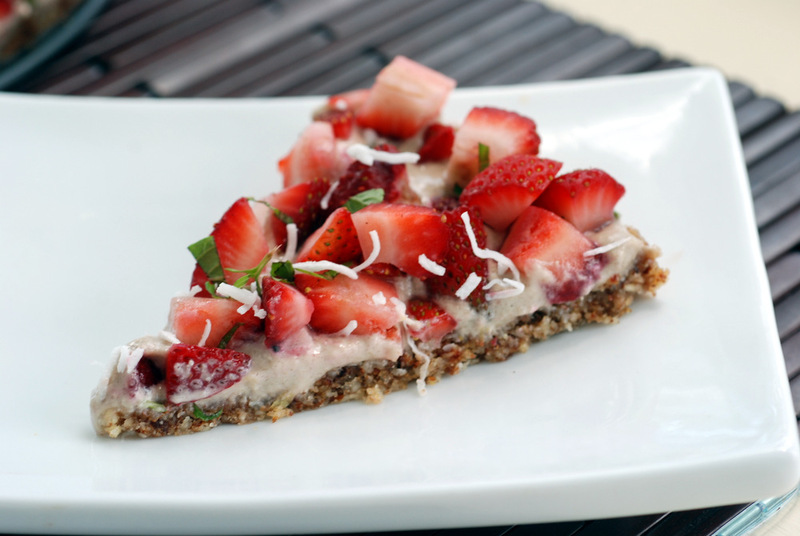 This is my submission to this month’s Bookmarked Recipes, to this week’s Wellness Weekend, to this month’s Simple and in Season, to this week’s Summer Salad Sundays and to Deb for this week’s Souper Sundays. Eating two heads of lettuce may seem trivial to some. In fact, for me, it probably isn’t much of a stretch to munch through…. of course, I never really have an empty fridge, so in addition to the new lettuce, I also had some spinach and beet greens to munch through first, and a bit of mixed greens, too. I also asked Rob to pick up some sunflower sprouts to spruce up some of my salads. Instead of coming home with a small packet of sprouts, he opted for the massive 1 lb bag of sprouts. Sprouts are light, trust me, it is a lot of sprouts! Why so many sprouts? They were 75% off! Priced to sell and for me to eat quickly! While cooking greens is an easy way to eat lots of them and to extend their shelf life, I wanted to savour the glory of the sprouts. Unlike most bloggers, I have yet to succumb to the Green Monster breakfast smoothies. I have gobbled down breakfast smoothies in the past, and have thrown in some greens for good measure, but I keep returning to my easy chocolate protein power oats and berries instead. What to do? Eat it for dinner! Make soup! Raw soup! 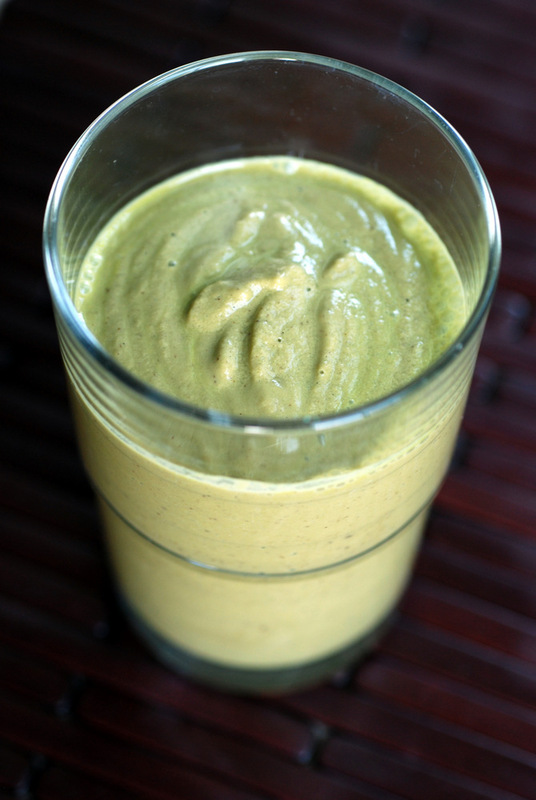 A blended salad! Even though I drank it in a glass, this wasn’t a juice. It was a creamy pureed soup. The soup was only warmed by the blender, a welcome change during the recent heat wave and the biggest difference from traditional soups. The sprouts are whizzed to make a lovely sweet green backdrop, sweetened by an apple, with depth added from lemon juice and dulse granules. The nuts and avocado add the protein and fat to make this a satisfying and filling soup and make it quite luscious. Not one to always like pureed soups, I really appreciated the fresh nature of this brew. With a side salad, it was a great meal. 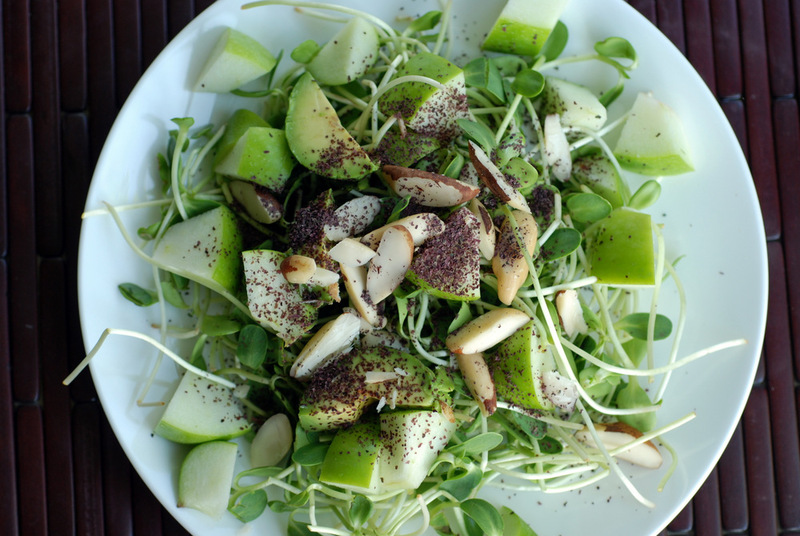 Raw soups have also been dubbed as blended salads, so for those that don’t have a high-speed blender, instead of making a lumpy soup, consider eating this as a salad instead! Eating all the sprouts can feel like you’ve turned into an animal (does anyone else feel like that with lots of sprouts? 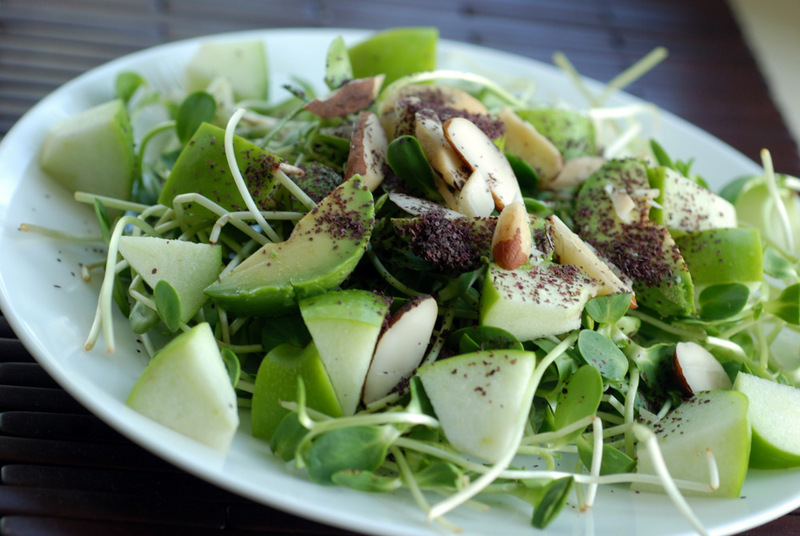 ), so maybe try substituting some of the sprouts for mixed greens. This is my submission to this week’s Summer Salad Sundays, to this week’s Wellness Weekend, to Cookbooks Sundays and to Deb for this week’s Souper Sundays. So, are you tired of all the quinoa yet? Or the salads? No? Good, me neither. Not yet, at least. The week of salads continues! One of my foodie goals in Colombia was to munch my way through quinoa and maybe bring some cheap quinoa back home with me. Turns out I couldn’t do that in Colombia. Quinoa is hard to find and when you find it, it isn’t any cheaper than what I can buy from my local favourite health store. Most Colombian locals had no clue what quinoa was.. except for the sole vegan I met (hi Juan!). 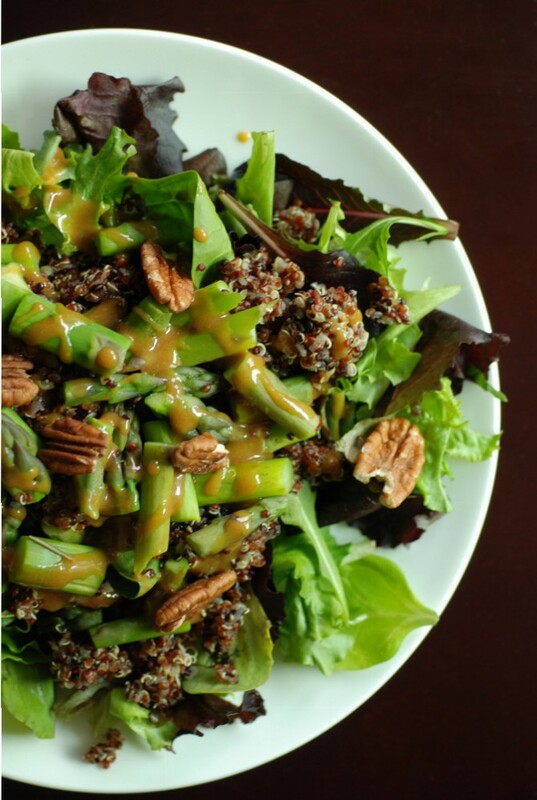 My latest kick is adding quinoa to vegetable sides to make it a more sustaining meal, and here I go again with this salad. 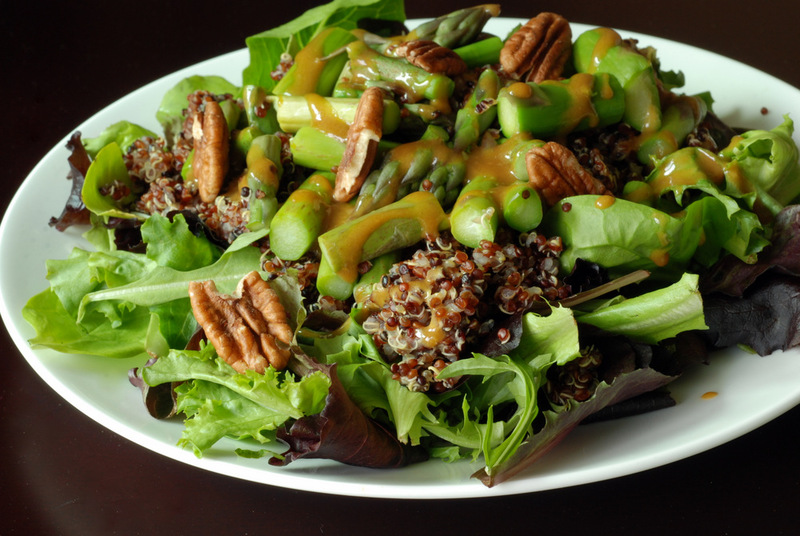 This would be a delightful salad without the quinoa, too, as it highlights the crisp asparagus and colourful baby greens with some crunch pecans. 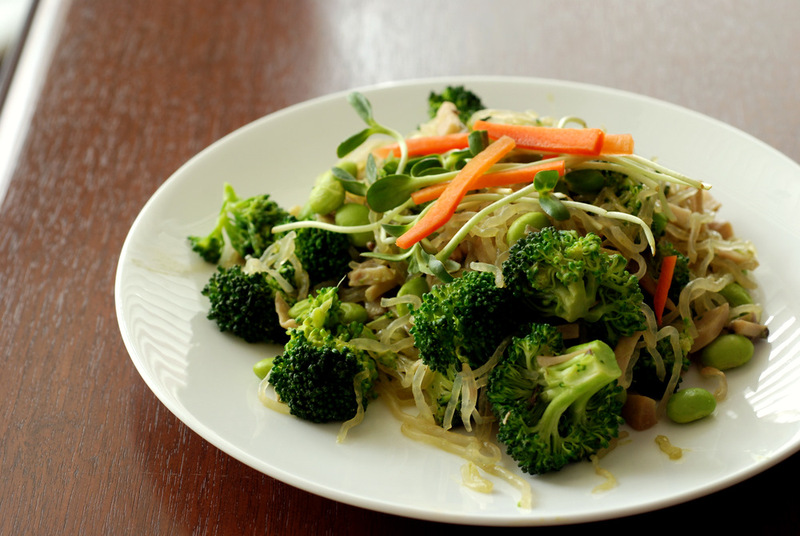 The dressing, a maple-mustard flavoured one, definitely brings the salad together with the tang from the soy sauce, the sweetness from the maple syrup and the deeper flavour from the mustard. This is my submission to this week’s Summer Salad Sundays, to this week’s Wellness Weekend, to this month‘s Simple and in Season, to Cookbooks Sundays and to Deb for this week’s Souper Sundays. I am talking about squash babies! It looks like my hand pollination of the kabocha squash was successful, with at least 2, maybe 3 baby squashes rapidly ballooning in size. This kabocha squash business is actually very high maintenance. Not only do I water them twice a day, I now inspect the blossoms to scout out the females. I am not leaving anything to chance and work my magic before the bees come a-buzzin. Seems to be working so far! Just late last week, Melissa Clark at the New York Times had a post (and video) about eating squash blossoms. The best part? They weren’t deep-fried! Her recipe was for a simple cheese and tapenade filling that used the blossoms as a wrap. While Rob and I nibbled on a few male blossoms this weekend, we’ll have to see how I incorporate them into a bona fide meal. 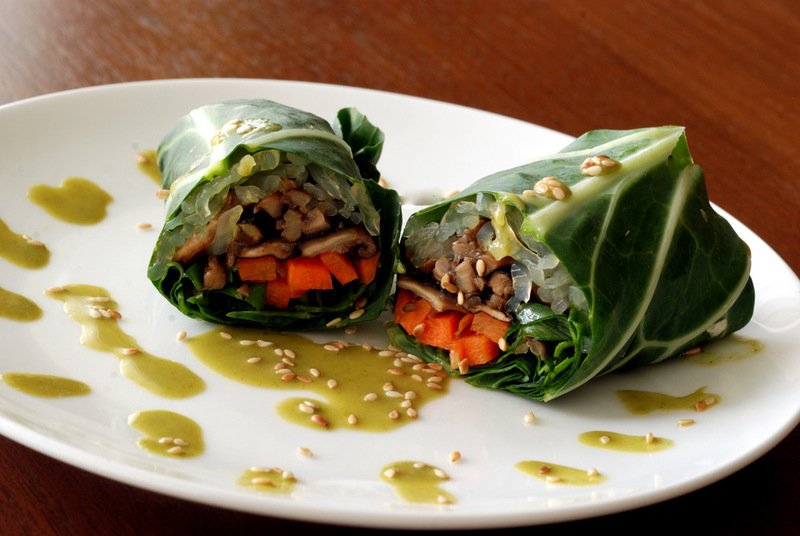 Somehow, I feel like it is more about the filling then the wrap, since it just tasted like a sweet veggie wrap! I seem to be late with all my strawberry loving this year, but the strawberries keep coming! Looks like the second round might be knocking. This is being submitted to this week’s Weekend Herb Blogging, hosted by Anca, Healthy Vegan Friday and to this week’s Wellness Weekend. I almost had 3 huge heads of lettuce to go through this week. In addition to my two heads of lettuce, a friend left their lettuce in the fridge by mistake and went home solo. Oops! I told him I would allow him to have his lettuce, if he would trade it for some blackberries from St Lawrence Market. Earlier, he had taunted me, telling me how small and sweet they were on his last trip. This is my submission to this month’s Bookmarked Recipes, to this week’s potluck party for fruit dishes, to this week’s Ingredient Challenge Monday for blueberries, to this week’s Summer Salad Sundays, to this week’s Wellness Weekend and to Deb for this week’s Souper Sundays.